This Avon resident was glad she could get laser treatment for her repetitive stress disorder. Barbara Phillips of Avon was tired of waking up in the middle of the night with excruciating pain. The 56-year-old says her hands would have an intense tingling sensation, and nothing she did could ease the discomfort. "I needed some kind of relief, fast," says Barbara. Neurologist Paul Silbert, M.D., chief of Neurology at Jersey Shore University Medical Center, did some nerve testing and determined that Barbara had carpal tunnel syndrome. Carpal tunnel syndrome (CTS), the most common repetitive stress injury (RSI), occurs from repetitive movements of the wrist and hand. These movements cause inflammation and swelling of tendons that pass through a narrow tunnel in the wrist, the carpal tunnel. As a result, the median nerve, which also passes through the carpal tunnel, is compressed, causing a potentially disabling injury. Initial symptoms of CTS include pain, tenderness, tingling and numbness, and shooting pain in the arm and shoulder. If left untreated, CTS symptoms can become so severe that a person can no longer perform simple tasks such as opening a jar or grasping objects. Dr. Silbert reviewed various treatment options with Barbara, and they both decided on a new, non-surgical treatment using the Microlight ML 830 Laser. Dr. Silbert provides therapeutic relief for CTS and other RSIs with this advanced, low-energy laser. It's painless and does not damage tissue. "The ML 830 is a non-thermal (cold) laser light capable of penetrating deep in tissues, painlessly and without damaging skin, tendons, or nerves," says Dr. Silbert. Barbara Phillips can now sleep through the night without pain. This is in contrast to traditional thermal (hot) laser light which can penetrate and destroy tissues. The laser treatment speeds up cell repair and stimulates the immune, lymphatic, and vascular systems. Dr. Silbert says that his patients with mild to moderate CTS and other RSIs who use this treatment experience a reduction in pain and inflammation and a speedier recovery time. The ML 830 Laser may also provide non-surgical therapeutic relief for tendonitis, tennis elbow, Raynaud syndrome, and thoracic outlet syndrome. "It has been two years since my treatments and I feel 100 percent better," says Barbara. "I would definitely recommend this to anyone who qualifies for it and who wants to avoid surgery. I can actually enjoy life again and participate in activities without the fear of pain." 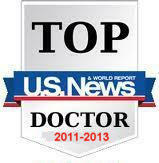 Dr. Silbert has been rated a "Top Doctor" by U.S. News. 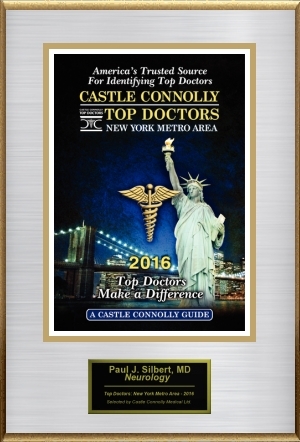 Dr. Silbert has been rated a "Top Doctor" by Inside Jersey Magazine. for the 13th year in a row.